Who knew that I could sew something other than a quilt? Tada! Thank you to Becca for the pattern. It’s certainly not perfect, so don’t look too close. There is a shorter version, and I think I will make it, also, as I think it will be my favorite of the two. I thought that bias tape was going to do me in, but I finally got it on there. The pockets were the most challenging, and I’m sure I didn’t do them quite right. Also, the zigzag stitching of the unfinished seams. How do you do that without it just kind of chewing them up? Can you tell that garment construction is not my strong suit? 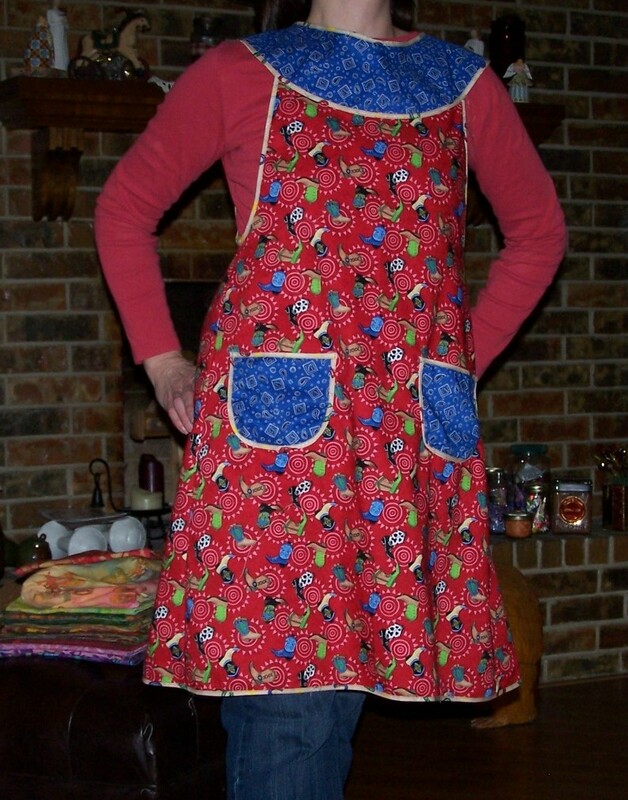 But, there are so many cute apron patterns, and I won this pattern from Becca, so I had to give it a try. I’m pretty happy with the end result…better than I thought I would do. It was a good distraction from other issues on my mind this weekend. Incoming Yardage to date: 75 yds. Outgoing Yardage to date: 66.75 yds. Total Stash Busted to date: -8.25 yds. And now this weekend is almost over…way…too…soon. I knew you could Randi 🙂 you are extremely talented and there probably isn’t anything you couldn’t do when you set your mind to it! 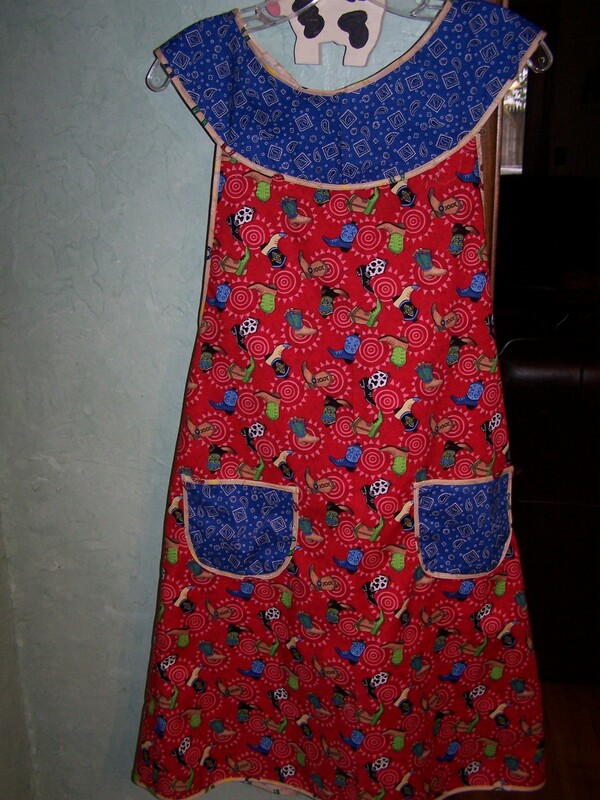 I should make some aprons as Christmas gifts this year…maybe the older girls would appreciate them. That looks great! I’m also eyeing apron patterns, and that one was on the list. I can see how the pockets would be challenging, and I have no idea how the zigzag thing works, either. Congratulations! The apron looks great………and used stash to boot. I thinking of making aprons for Christmas presents this year. That pattern looks wonderful. You’ve gone 3-D! What next!? oooooo… love that apron! It has a nice length for protection from who knows what, and the neckline is really good. Nothing to tie around your neck, and nothing to fall off your shoulders. Reminds me of the old Hank Williams song “Hey, hey! Good Lookin’ ~ what’s ya got cookin’?” ha ha Definitely music to bake by. Oh your apron is too cute! Anything that isn’t totally flat is a challenge! bias tape can be a nightmare. And I cheat, I have a serger if I REALLY want to finish those seams! An apron would be great, I have a pattern and I am waiting for my best friend to visit as we had both planned to make aprons while she is here! This apron looks like one June Cleaver or Donna Reed wore! I really like it, but like you, I think I would prefer one a bit shorter! That is just too too cute! Its WONDERFUL!! You did a super job! Thanks for sharing the pictures! I cheat by lining everything I do so that I dont have to do the finishing thing. No pointers on the bias tape.Yours looks as good as I have ever done! 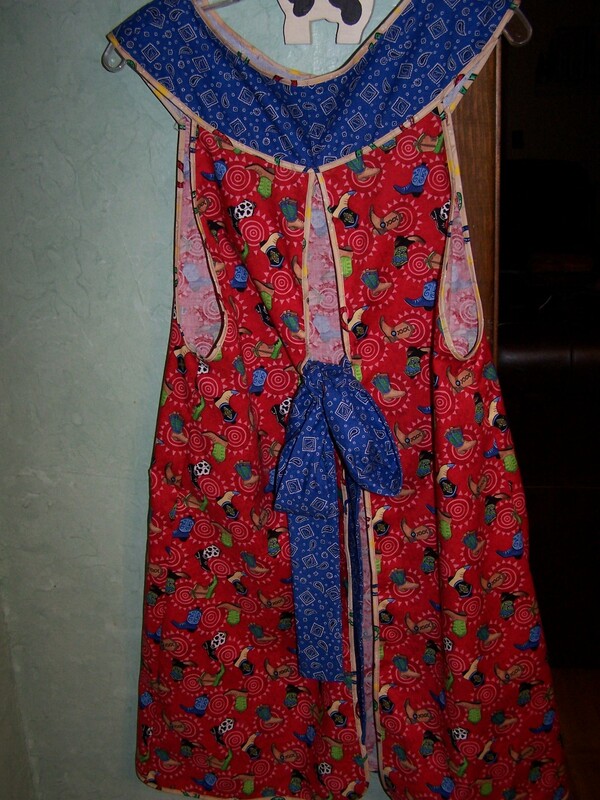 What a cool apron – love the fabric, colors and pattern. Nice job!